The 1.0 version released didn't have all the dynamic libraries so I spent a long time figuring out why OpenCV would not compile on Yosemite. Once I got it to statically compile I was able to create a version of the program that doesn't require all those libraries. I also upped the textures resolution so it looks cleaner and clearer. New in version 1.2 you now have the option use a file instead of a live camera as the video source. For some reason I cannot find the OS X version of the newest Runtime on the Oculus page. Hopefully they are not turning to the Dark Side and dropping support for Mac/Linux. So I have included in this page a link to download the latest OS X Runtime. 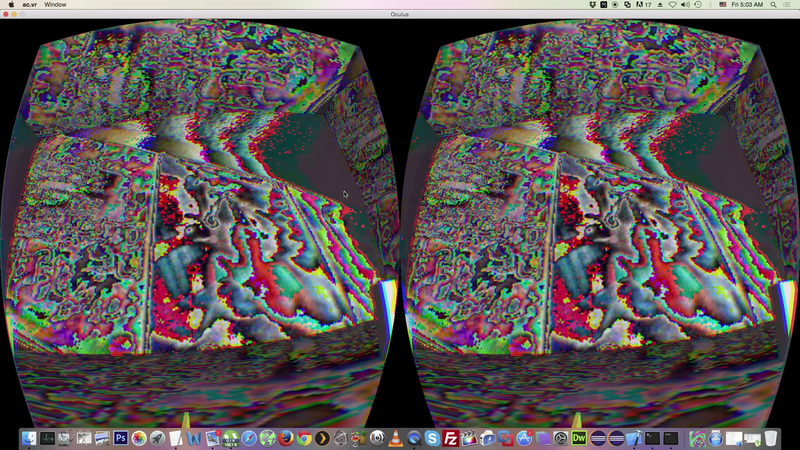 Acid Cam VR creates 3D visualizations for the Oculus Rift DK2. What you need to use this program. Press the Up and Down arrow keys to change the filter. Each filter is a different effect. Or compile it yourself all you need installed is SDL2 and OpenCV 2.4 build both from source.